With the help of a Research Fellowship worth almost $500,000 granted by the GPRWMF, The Bionic Voice Project started in July 2015. Dr Farzaneh Ahmadi, a postdoctoral research fellow at the Biomedical Engineering and Neuroscience (BENS) group at the MARCS institute, Western Sydney University, is working on a design of the first non-invasive electronic voice prosthesis. 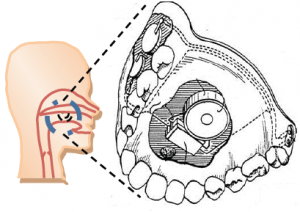 The aim of this project is to return the power of natural sounding speech to laryngectomy and other voice-loss patients using non-surgical, non-invasive, non-intrusive electronics. The prosthesis consists of two design modules: an electronic voice source (Figure 3) using respiration to generate voice and a neural interface (Figure 2) to control the pitch of the Bionic Voice source. Figure 2: Intraoral voice source (Credit: Research Fellowship Progress Report 2015 by Dr Farzaneh Ahmadi, MARCS Institute, University of Western Sydney). The team has finalised the design of the Bionic Voice prosthesis and is evaluating it through trials of the solution on laryngectomy patients in collaboration with Sydney Voice and Swallow. So far, the bionic voice source has been capable of controlling the voice onset and offset with 96% accuracy. In July 2015 the project sparked national and international interest at the World Congress of Larynx Cancer in Cairns. Since then BENS and the Singapore General Hospital have collaborated to support pre-clinical trials, to examine control of the voice using respiration. The voice conversion for patients with spasmodic dysphonia is being supported by the clinic Sydney Voice and Swallowing and was launched in January 2016. Another collaboration is being considered with the ENT Department of the Children’s Hospital at Westmead to generate voice for children with tracheostomy. The Department has supported the Research Group to test feasibility and gave access to suitable patients. If feasible, this will extend the scope of the Bionic Voice from the elderly group of laryngectomees to include children with severe voice issues.